Your lighting fixtures say a lot about what you think about your home's decore. Copper outdoor lighting fixtures are not only durable but an elegant source of outdoor lighting that really adds character to your home's outdoors. They are a wonderful addition to a home because they combine that old time look and feel to a home's outdoor environment which makes you feel so warm and welcome. Copper fixtures come in all different shapes and styles. Its up to you to decide which ones make the cut and which ones won't be included in your home's outdoor lighting setup. Since not all light fixtures are designed to be part of your decorative lighting design, you may want to decide if you're going to be purchasing copper outdoor fixtures that will be hidden or ones that will be seen in plain view. An alternate approach would be to use powder coated outdoor recessed lighting fixtures for those fixtures that will not be displayed for aesthetic reasons. Simply doing that will save you lots of money and won't impact the beauty of your lighting setup. Copper lighting fixtures come in a variety of different styles ranging from uplights to path lights to custom made lights. Typically, style is of the utmost importance when deciding on outdoor copper lighting because copper fixtures are often designed to be decorative. Because of this, many copper fixtures have a distinct character to them that brings out the richness of an elegantly designed landscape, patio, or deck. Finding the perfect decorative outdoor lighting fixtures can be challenging because of the extensive array of fixtures to choose from. Its also very important that the fixtures fit in with your outdoor decor as well. If you haven't already figured it out, copper lighting fixtures over time will tarnish. Ultimately this will change the color of the fixture since oxidation will eventually occur. This change in color and lustor is mostly embraced as a part of the beauty associated with copper outdoor lighting fixtures. This change adds an antique outdoor lighting feel to your environment. Often, the manufacturer will add lacquer as a protective coating on the newly polished copper fixtures to prevent the fixtures from tarnishing too quickly. Once the lacquer wears off, the copper will begin to tarnish. Over an extended period of time and exposure to the outdoor environment, the oxidation will give the copper fixture a light blue-green finish. Check out brass outdoor lighting for that antique tarnished look you desire. 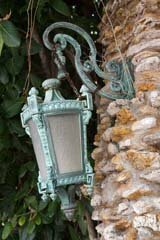 Before making your final decision about which copper outdoor lighting fixtures to choose, there are a few things to think about. Envision what you ultimately want to achieve with your outdoor lights. Its important to know what you want your guests to focus on and notice the layout and theme of your outdoor landscape so that you can narrow down your choices. If you want to light a path or deck, you may decide that you're going to choose fixtures that are non-obtrusive and not very noticeable. On the flip side if you have a beautiful entryway, you may want to decorate your outdoors with the classy and beautiful look of copper outdoor wall lighting fixtures. There just is no better way to dress up your outdoor entryway. Knowing this in advance will help you to spend less time and energy deciding what to buy or buying fixtures that don't really fit your outdoor's beauty and charm.